While the CPO and the CFO might occasionally battle like the gods on Olympus, there are still many things us mere mortals can do on earth to increase peace, harmony, and profits. In this paper, Pierre Mitchell walks through the most common issues that keep procurement and finance apart and also, the most important areas where they should drop their lightning bolts and rule together in peace (enterprise risk management, working capital optimization alongside cost reduction/compliance, and aligning purchasing and A/P). 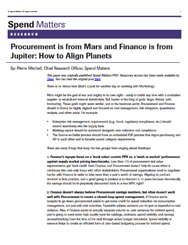 To get your free copy of Procurement is from Mars and Finance is from Jupiter, please complete the short form below. Members: Skip the form and log in to grab your free copy. Our downloadable research explores bigger picture areas and issues. Please select your interest to view available downloads.